Over the last 12 years, the school has grown to serve about 225 students in Kindergarten through 12th grade. They have developed a well-rounded program that offers traditional academic classes, as well as fine and creative arts such as violin, guitar, keyboarding, and dance. Athletics include full-contact football, volleyball, basketball, soccer, and cheer. Golden Rules’ high school students can dual enroll at the college level or take virtual classes to accelerate meeting their educational goals. The school also recently ventured into a new STEM program that garnered recognition for their high school boys. 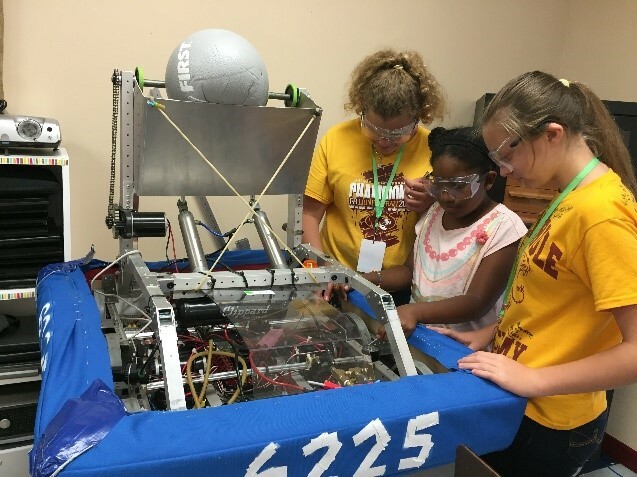 Golden Rule was the first school in St. Lucie County to compete in the national FIRST (For Inspiration and Recognition of Technology) robotics program. For six weeks straight, the school’s 9-12th grade boys’ team worked on building their robot – including before and after school and weekends. Their hard work paid off and they ended up ranking in the top 50 percent. Next year, with adequate funding, the school hopes to expand the program to include LEGO robotics for elementary through high school students. AAA Scholarships are funded in Alabama, Arizona, Florida, Georgia, Nevada, and Pennsylvania by corporations that redirect a portion of their state tax liability to the AAA Scholarship Foundation in exchange for a tax credit (dollar for dollar in Alabama, Arizona, Florida, Georgia and Nevada, and up to 90 percent in Pennsylvania). The AAA Scholarship Foundation is one of the only approved Scholarship 501(c)(3) Nonprofit Organizations exclusively serving qualifying low-income, disabled and/or displaced students through these Scholarship Tax Credit programs. AAA Scholarship Foundation provides your company with the convenience and efficiency of a single-solution for participating in multiple state tax credit scholarship programs. For more information or to learn how your corporation can participate in the program, visit www.AAAScholarships.org, or contact Kerri Vaughan at kerri@aaascholarships.org or 888 707-2465 ext. 730. Click here for a pdf of this spotlight story. 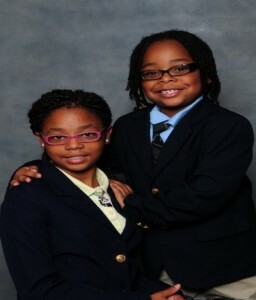 Zynia and Antwan have both continued to excel at New Life. Since attending the school, Zynia, who just completed 5th grade, has opened up and actively participates in her classes, and has formed positive friendships with her classmates. She loves math and continually excels in the subject, even serving as a tutor to other students. 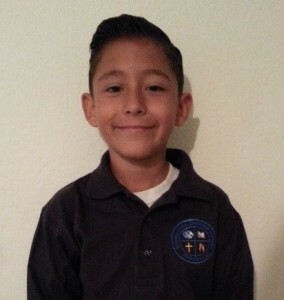 Antwan – although he only just completed Kindergarten – has become an avid reader and is developing fine penmanship skills, including cursive handwriting. Both children also participate in the school’s extracurricular activities, including dance and softball. AAA Scholarships are funded in Alabama, Arizona, Florida, Georgia, Nevada and Pennsylvania by corporations that redirect a portion of their state tax liability to the AAA Scholarship Foundation in exchange for a tax credit (dollar for dollar in Alabama, Arizona, Florida, Georgia and Nevada, and up to 90 percent in Pennsylvania). The AAA Scholarship Foundation is one of the only approved Scholarship 501(c)(3) Nonprofit Organizations exclusively serving qualifying low-income, disabled and/or displaced students through these Scholarship Tax Credit programs. AAA Scholarship Foundation provides your company with the convenience and efficiency of a single-solution for participating in multiple state tax credit scholarship programs. For more information or to learn how your corporation can participate in the program, visit www.AAAScholarships.org, or contact Kerri Vaughan at kerri@aaascholarships.org or 888 707-2465 ext. 730. The beaming smile that shines through in Jeremiah Sanchez’s photo speaks volumes for how much he has overcome in the short amount of time he has spent at The ABBIE School in Tucson, Arizona. As a child with Autism, his struggles in school and life have become harder over the years. However, a scholarship from the AAA Scholarship Foundation has enabled him to receive an education tailored to his individual needs and he is soaring. 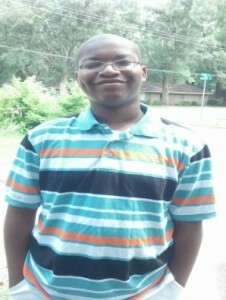 Jeremiah, currently in the 6th grade, is the oldest of four children. For most of his young life, his mother Amber Sanchez – who works as a waitress at Denny’s restaurant –struggled as a single parent to make ends meet and provide for her children. (It was not until recently that she met and married her husband Gerardo, who also works at Denny’s as a cook and now fulfills the role of a father figure to her children). Although Amber enrolled Jeremiah in education programs at age 3, he had a difficult time in school from the start. He failed and had to repeat Kindergarten. He was bullied by classmates and had no friends. Amber figured that her son was just facing difficulties and that it was something they would deal with over time. However, as she started doing research on Autism, his behaviors and actions made more sense. She began to understand him better, and in turn, see how the educational environment he was in could help or hurt him. Jeremiah’s challenges began to deepen the older he got. He dealt with constant anxiety both in and out of school. Everyday life became harder for him and it spread to other areas of his home life. As she began to better understand her son’s needs, it became clear that the local public school was not a good fit for him. The final straw for Amber came during the beginning of Jeremiah’s sixth grade year, when he came home from school covered head to toe in red paint that other children had poured on him. In that moment, she knew she had to make an immediate change to save her son from a disastrous future. But finding the right school – and determining how to afford the tuition – was the challenge she faced. As Amber searched for school options in the Tucson area, she came across The ABBIE School, which encompasses an educational style and specialty that could address Jeremiah’s unique needs. It was through the school that Amber also learned about the Lexie’s Law Program, a scholarship for special needs students available through the AAA Scholarship Foundation, which would help ease the financial burden and enable them to enroll Jeremiah at The ABBIE School. Jeremiah was approved for the scholarship and enrolled at The ABBIE School in the fall of 2015. Within a couple months, Jeremiah underwent drastic changes. He went from a child who was constantly bullied by his peers to one who is able to form new friendships with his classmates. Once a child who was withdrawn, he performed – with a speaking role – in his first Christmas play in December 2015. His home life has improved greatly as well. Attending the school – where students are referred to as “scholars” – has made him feel special, a place that he gets to go where he has his own friends and attends classes that he enjoys. The school has even helped stir up his own ambitions for the future and he now dreams of studying computer programming and coding, and inventing his own games. For Amber, Jeremiah’s experience thus far has given her tremendous hope. As a single mother on a limited income, Heidi Maldonado works hard to ensure that her son, eight-year-old Daniel, is given the tools to reach his fullest potential in life – including a strong educational foundation. However, living in the state of Nevada – where the education system is ranked last in the nation – Heidi knew early on that not every learning environment is suited for every child and that she must play an active role to ensure that her son does well in school. Heidi and Daniel’s father divorced when Daniel was only two years old. Soon after the divorce, Heidi’s mother moved in with Heidi and Daniel, helping to provide a support system and alleviating some of the financial burden. With some of their living expenses offset through this arrangement, Heidi was able to send Daniel to International Christian Academy from preschool until first grade. The school helped to draw out Daniel’s natural abilities and he advanced quickly in reading and other areas. However, after Heidi’s mother moved out, Heidi could no longer afford the private school tuition and decided to move Daniel to the local public school. The move to a new school was a hard adjustment on Daniel, as he tried to get used to the different environment, which included a larger class size with less individualized attention. Additionally, Daniel was too advanced for his grade level, and Heidi was disappointed to find out that the second grade class was covering lessons and academic skills that Daniel had already mastered in Kindergarten. To add additional challenges to the situation, the school also mistakenly placed Daniel in an English as a Second Language Program, even though he did not speak Spanish and had a strong skillset in English. In fact, he was already reading on the fourth grade level in second grade, putting him significantly ahead of his other classmates. No longer being challenged, Daniel soon became bored in class after completing the daily assignments before his other classmates, and the teacher was not able to redesign the lessons to challenge him. He would use his free time to write stories every day – which are now collected in a large folder his mother keeps at home. Heidi was glad to learn her son was so advanced, but worried that without a challenging curriculum to keep him engaged, he would become stagnant or lose interest in school all together. Therefore, Heidi tried to supplement his schoolwork by giving him extra assignments to work on at home. Additionally, knowing that his teacher was already stretched thin with 30 other children and no aide in the classroom, Heidi would take time off from work when she could to come volunteer in his class in an effort to help. 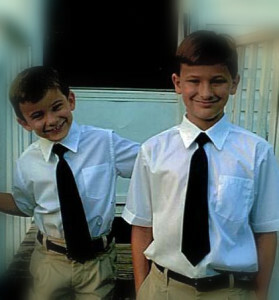 However, as time went on, she knew Daniel would need to be in a more challenging environment to help him continue to grow and not lose interest in school. When the Nevada Educational Choice Scholarship was created in 2015 and the AAA Scholarship Foundation opened up applications for income-qualified families, Heidi knew she had found her solution and applied for a scholarship for Daniel. Once they were approved to receive the scholarship, she did not hesitate to move him back to International Christian Academy, even though it was already in the middle of the first quarter of the new school year. She knew Daniel’s strong abilities as a quick learner – combined with the hands-on staff at International Christian – would enable him to make the transition easily. Heidi’s instincts were correct. After only being back at International Christian Academy for six weeks, Daniel was already excelling in his third grade class. In math, he went from adding double digits to being able to multiply and divide – all in less than two months. He is also continuing to excel in reading and writing. Beyond that, Heidi is most pleased to see Daniel’s excitement about learning has returned. As a parent, for Heidi the scholarship has alleviated the financial burden as well as the stress she was experiencing trying to keep her child engaged in learning. Kids Count Data Center. (2014). The Annie E. Casey Foundation. http://datacenter.kidscount.org/. The typical AAA Scholarship student is an ethnic minority living with a struggling single parent/caregiver in a high crime community. The average household income of families accepted to receive scholarships is $23,559 for a family of four. Many children are either below grade level, failing at their previous school or both when they receive a scholarship. Parents, who find their children in these circumstances and care about their future, look for viable options. They seek an atmosphere that challenges their child to reverse inadequate learning and/or social patterns and the potential lifelong negative impact. They wish to change their child’s learning environment, acquaintances, and the unfortunate predictable outcomes associated with school failure. Many of our donors and families remember Quinton Johnson. He was a spotlight student in April 2013. 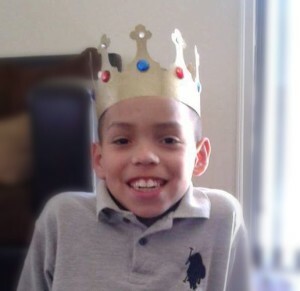 Quinton is a preeminent example of what can happen in a child’s life if they are given the opportunity to choose the school that best meets their unique learning needs. As a child, he experienced the “harshest of circumstances.” Then it was determined that he should be in the care of his grandmother, Verdelle Johnson, who saw such potential in Quinton that she searched out help to get him into a school that would share her vision for his future. At just 14 years old, he said “My grandma showed me that I could do better things with my life, she taught me to try my best in everything I do.” The theme that comes to mind for those that know him is “character.” Quinton strives to show through his actions how you can influence your future with a little help from others. After losing his father when he was only 12 years old, Patrick Vega vowed to help his mom in any way that he could. He realized that succeeding in school and being a productive member of his family and the community were the best things he could offer. Thanks to a scholarship from the AAA Scholarship Foundation, Patrick has been able to fulfill that promise and has risen as a star at his school – excelling in academics, sports and other extracurricular activities. The untimely passing of Patrick’s father left an empty space in the Vega family and put a financial strain on Patrick’s mother, Gracie. She was determined to keep Patrick on track with his academics during this tough time, but worried that she would not be able to afford the tuition for him to attend Bourgade Catholic High School, where his older brother attended and where the members of the church and school had served as a close-knit community for the Vega family after the loss of her husband. However, after consulting with the financial aid department at Bourgade, she learned about the AAA Scholarship Foundation and applied. Receiving the news that Patrick was approved for a scholarship provided Gracie with a huge sense of relief and reassurance that her family was going to be okay. As he wraps up his junior year, 17-year-old McKinley Habersham is thriving in his first year at Memorial Day School in Savannah, Ga., a school he is able to attend through a scholarship from the AAA Scholarship Foundation. It’s hard to imagine that only a year ago, while still coping with the tragic loss of his father, McKinley was struggling academically and had lost all interest in any future ambitions. For most of his life, McKinley had done very well in school, including earning a regular spot on his public school’s honor roll. However, tragedy struck the Habersham family in 2008, when McKinley’s father passed away during the explosion at the Imperial Sugar Factory. McKinley was crushed and while therapy helped him deal with his emotions, his mother, Latesha Habersham, saw it as the starting point of his dwindling interest and ambition in school.